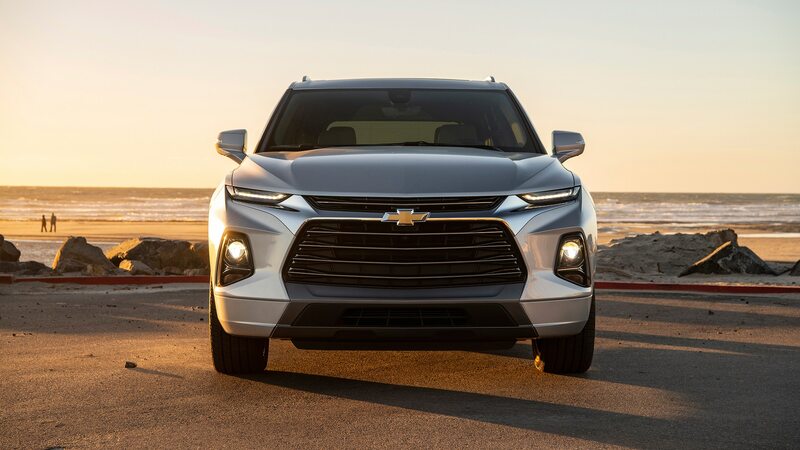 It’s a fine SUV, but we'd still prefer to drive the real Camaro. 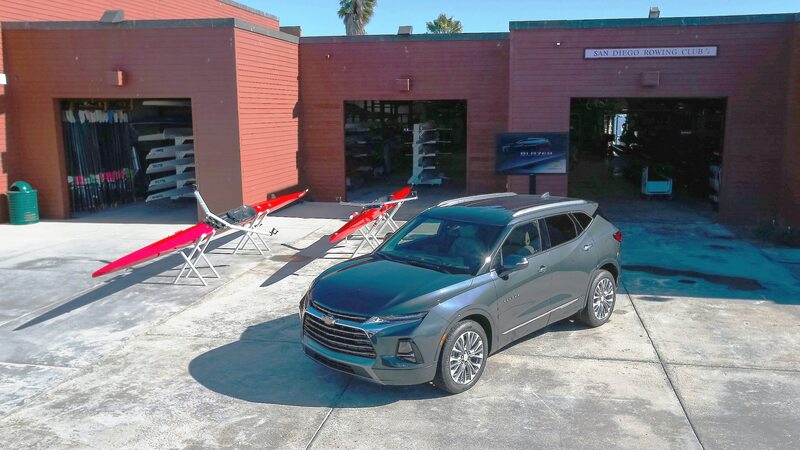 SAN DIEGO, California—Who needs a two-row midsize SUV? 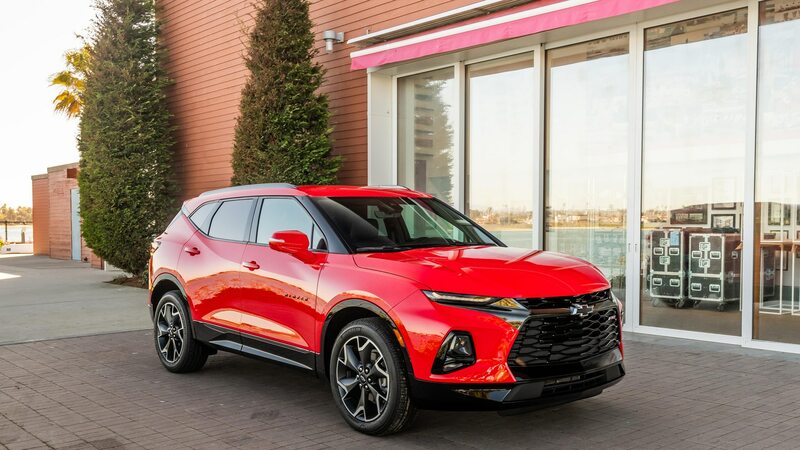 No one, really, because a one-segment-down, compact two-row like the Toyota RAV4, Ford Escape, or Chevrolet Equinox will carry nearly as much, very likely be priced lower, and probably get better fuel mileage. 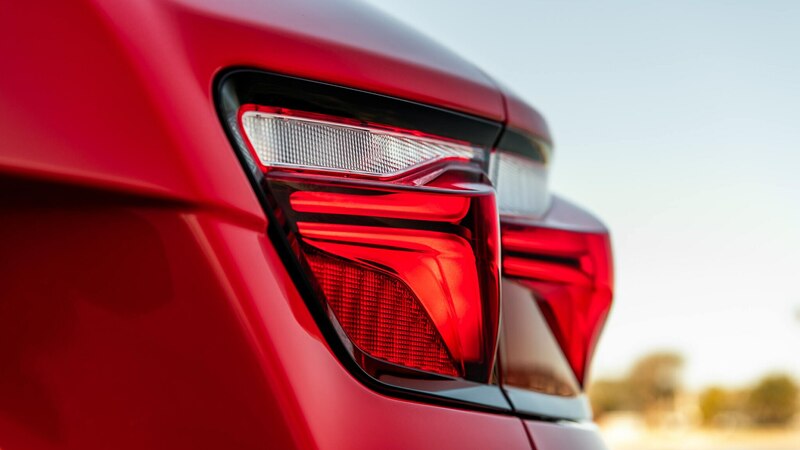 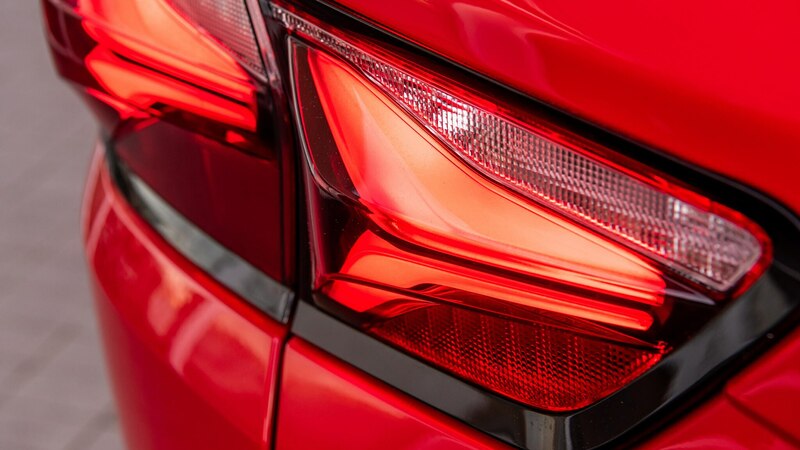 It’s that category that is rapidly replacing midsize sedans as the vehicular appliance of choice. 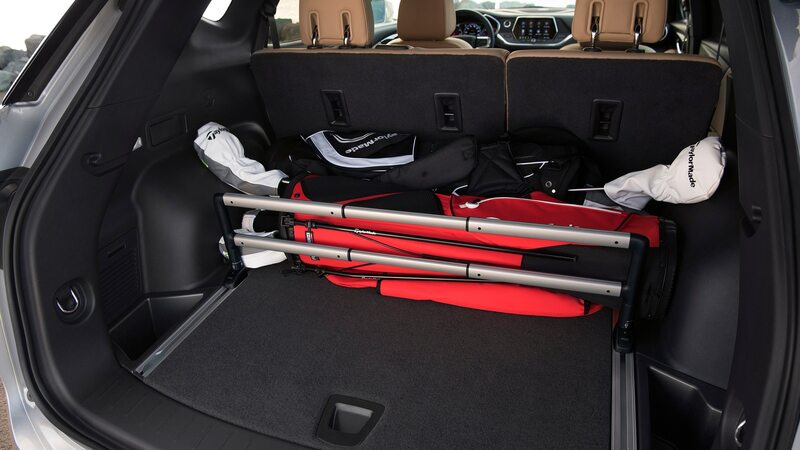 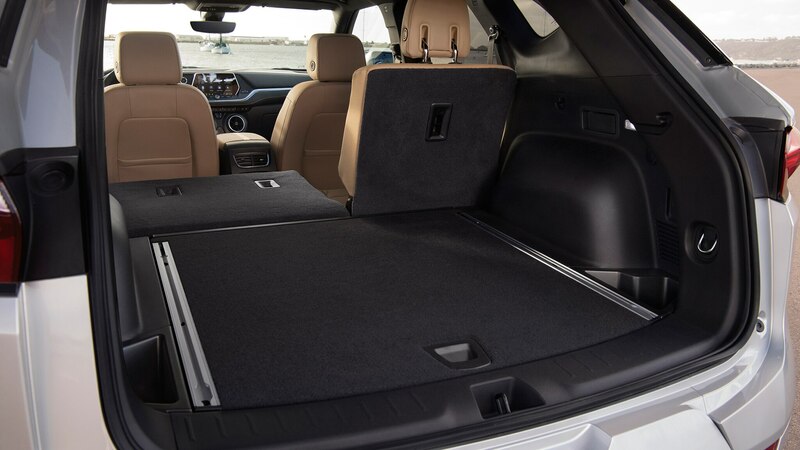 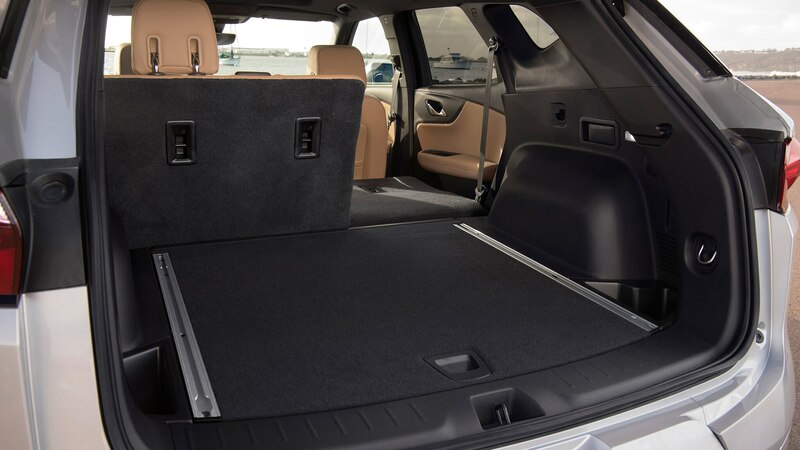 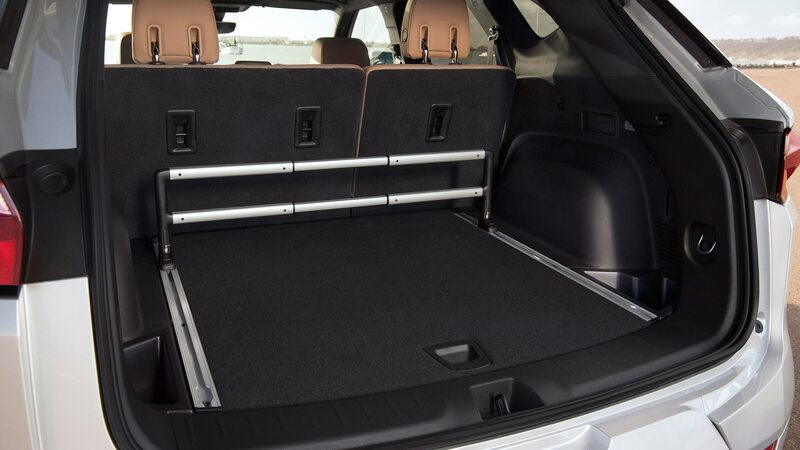 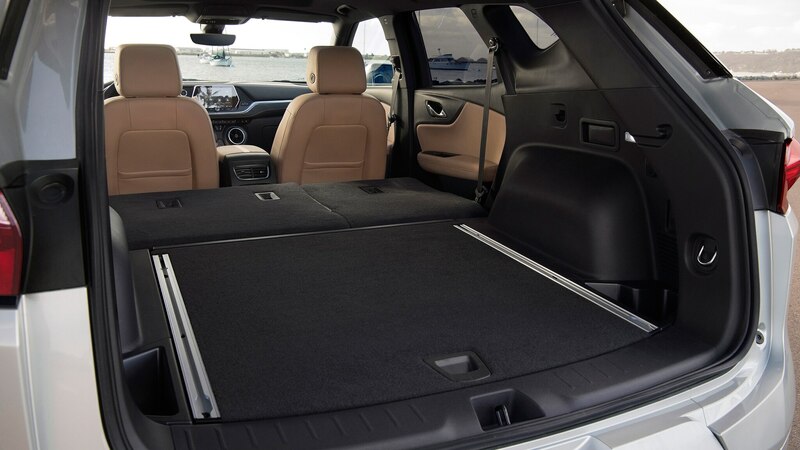 If you something larger, it’s likely because you need that third row for kids and their friends, or even the extra cargo space with some or all of the seats dropped flat—things that two-row midsizers don’t offer. 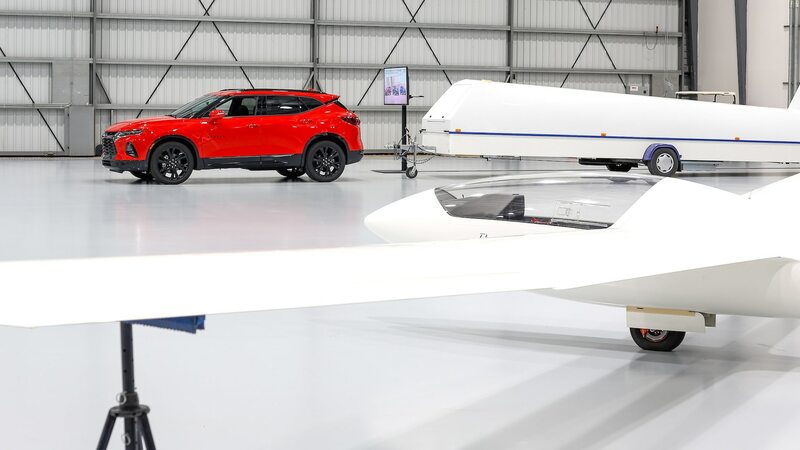 But the people who buy such SUVs definitely want them; they’re a lifestyle choice. 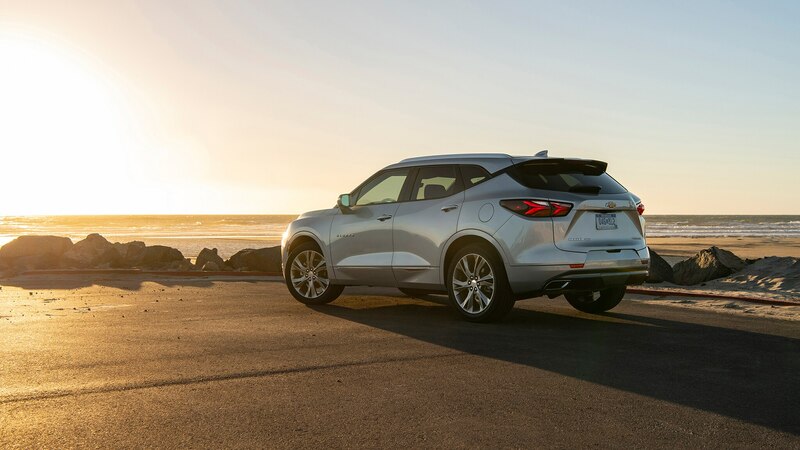 They’re generally sold in higher trim levels, and with more optional equipment, compared with three-row family SUVs. 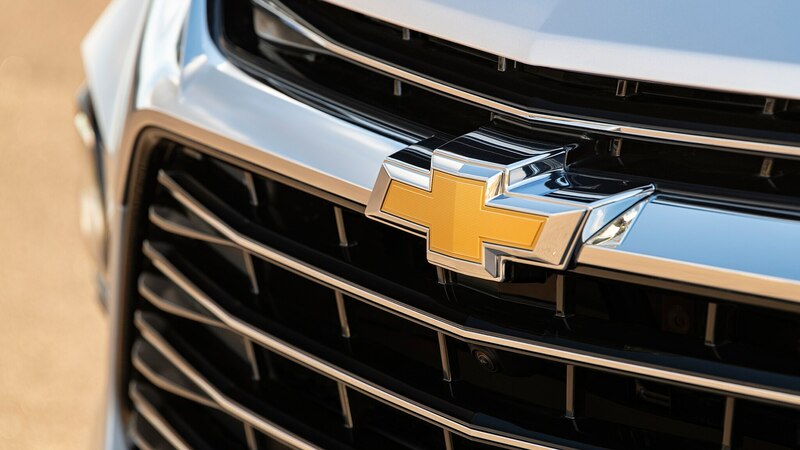 They mostly offer V-6s or at least powerful turbocharged four-cylinders, and sometimes even V-8s. 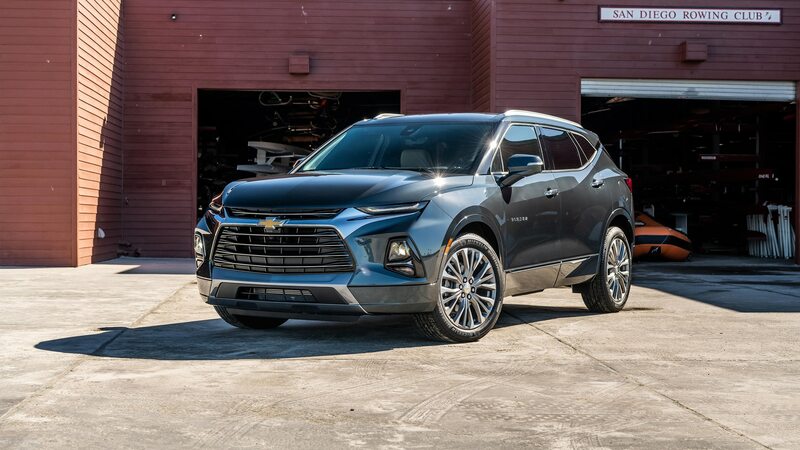 And they tend to be more expressive and more stylish than other SUVs, although that often isn’t saying much given the struggle companies face in distinguishing their tall, slab-sided, two-box models from everyone else’s. 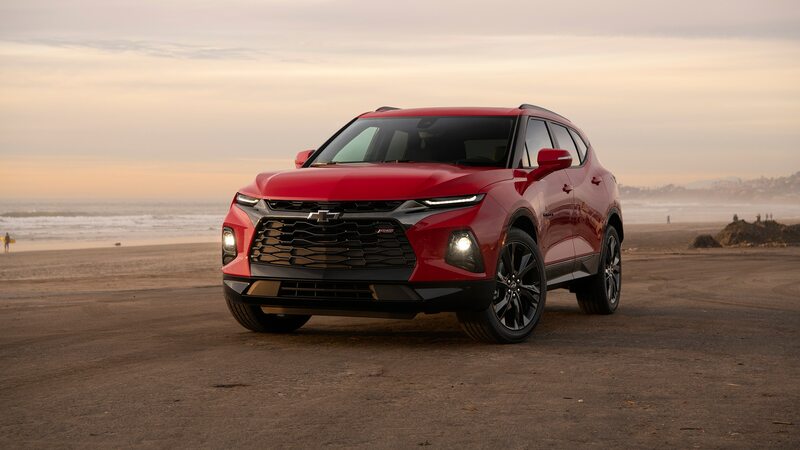 In short, even if they have four doors, those without cynicism could call them the SUV age’s answer to the Ford Mustang and Dodge Challenger. 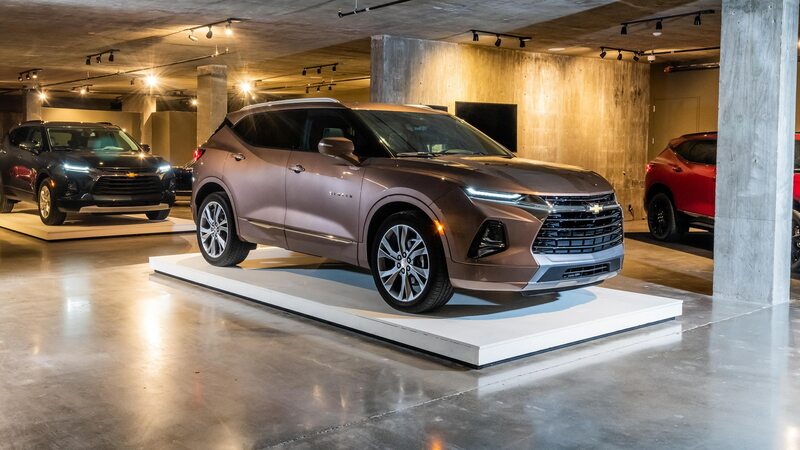 Indeed, GM wants you to see the 2019 Chevrolet Blazer, a late-ish entry into this hot segment, as a Camaro analog. 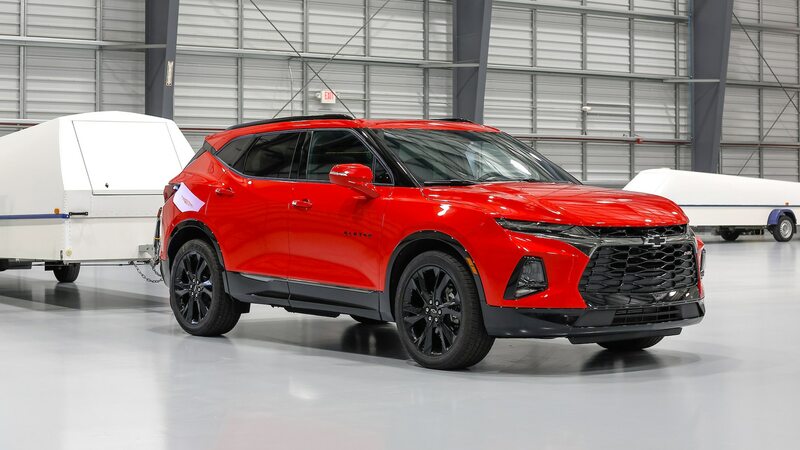 Aesthetically, it has enough style to make Bill Mitchell proud, with a bit of Coke bottle to its shape and a pointy grille, and it is possessed of the same general look that made the reborn Camaro the bestseller in its segment for a while a few years ago. 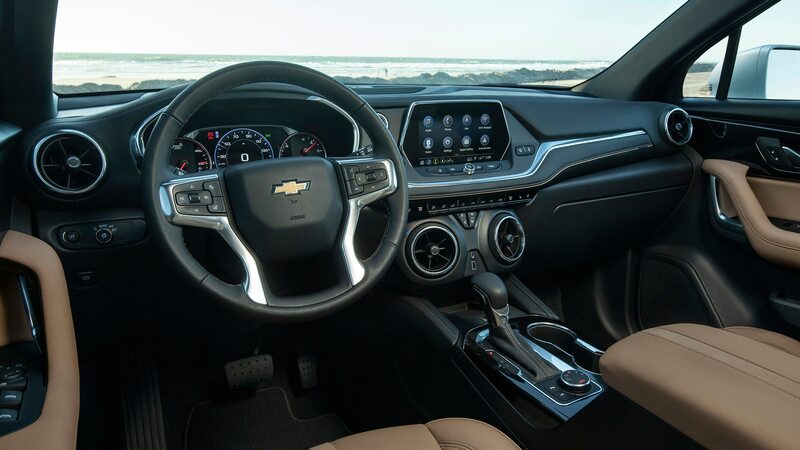 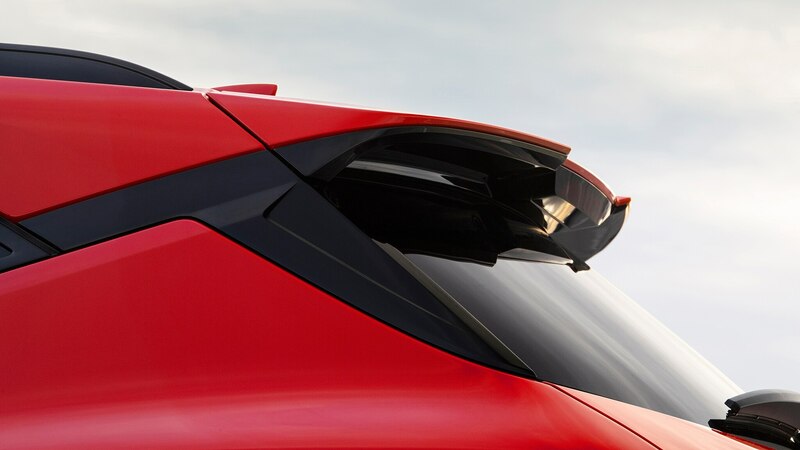 The parallel continues inside, with Camaro-style round HVAC vents punctuating the Blazer’s dashboard. 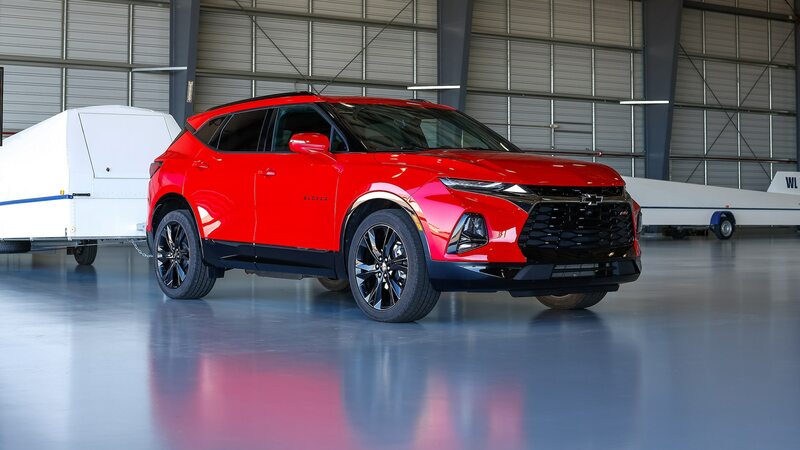 Lest I take this Camaro story too far, note that there is no hotted-up SS version, as Chevy’s latest crossover is available in L, Blazer, RS, and Premier spec. 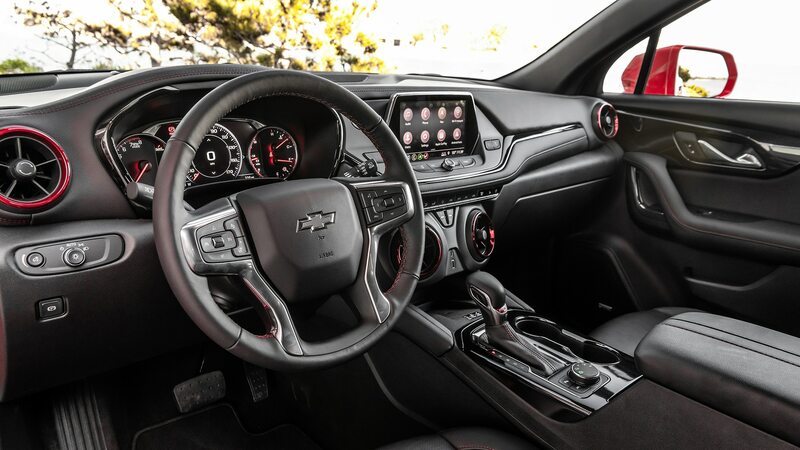 Both of the latter versions’ interiors are nicely finished with quality materials, punching above the Blazer’s price class inversely to the impression one gets from Cadillac’s SUVs. 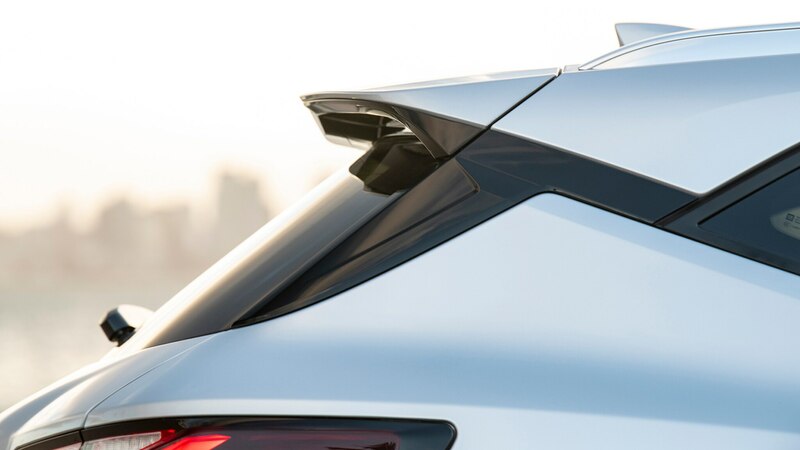 Outside, the RS has black trim instead of chrome, with a black grille and bowtie. 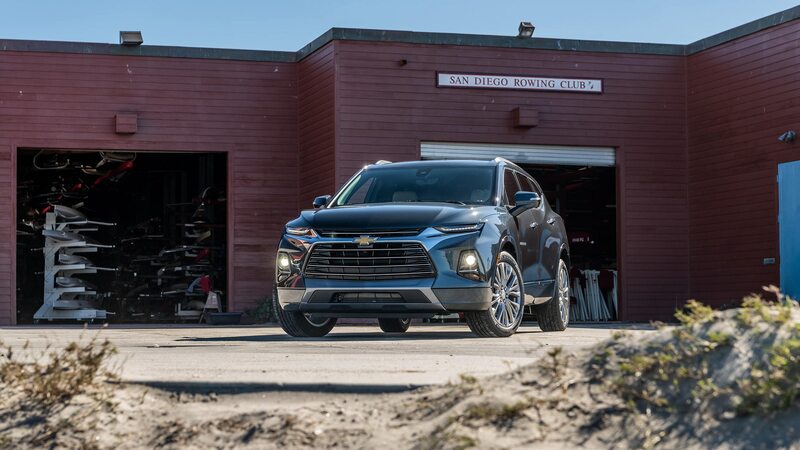 Both the RS and Premier come standard with a naturally aspirated 3.6-liter V-6 making 308 horsepower, just 27 shy of the Ford Edge ST’s 2.7-liter EcoBoost turbo V-6, though the Blazer’s 270 lb-ft can’t compete with the Edge’s EcoBoosted 380. 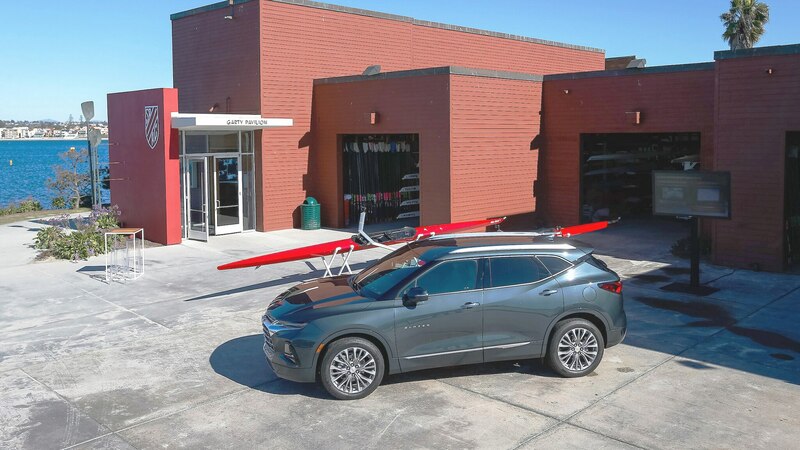 Even with this deficit, though, the new Blazer feels plenty powerful and offers a smooth, steady launch from a stop—though without the Edge ST’s kick in the backside. 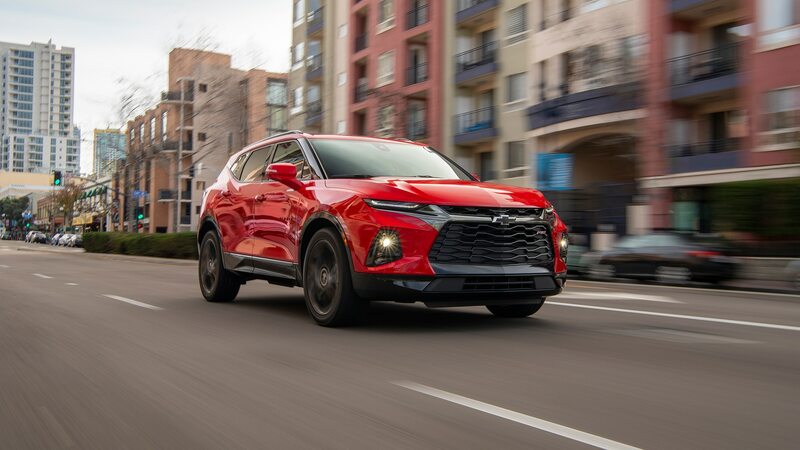 Our friends at Motor Trend recorded a zero-to-60-mph time of 6.1 seconds in the all-wheel-drive Ford, and Chevy estimates the Blazer V-6 can hit the same speed in about 6.5 seconds with front-wheel drive. 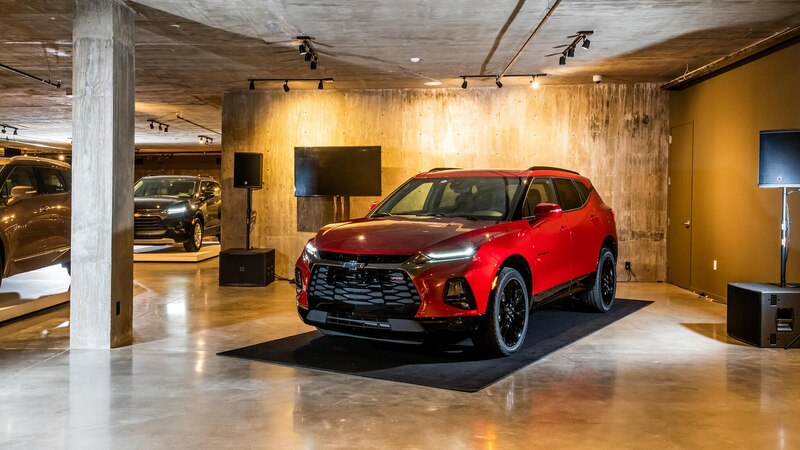 Paradoxically, the all-wheel-drive version is estimated to be a couple of tenths slower; this won’t matter much to its consumers, but most vehicles are quicker with four driven wheels owing to more off-the-line grip. 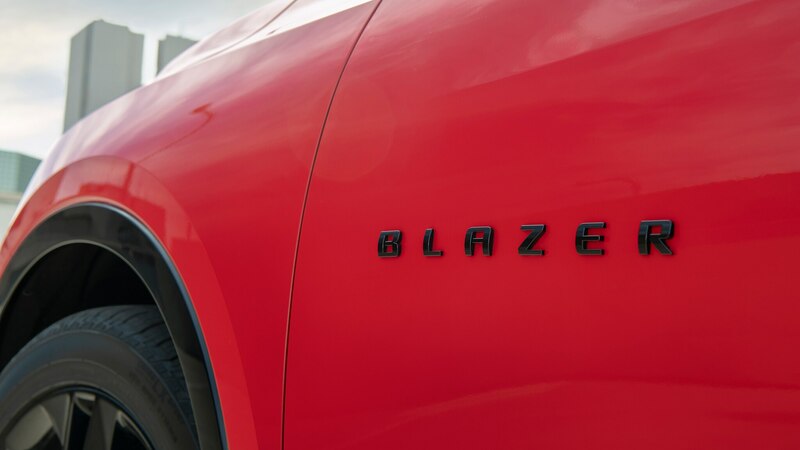 The standard Blazer engine is a naturally aspirated 2.5-liter inline four-cylinder, which I did not get to sample. 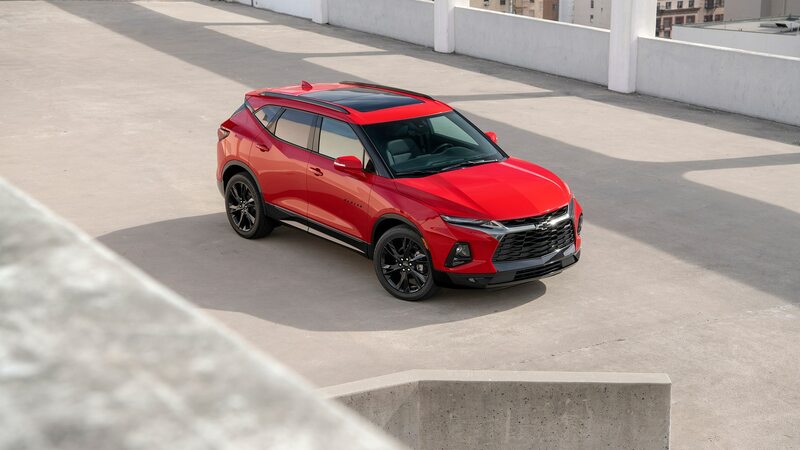 With this four available only on the lowest L trim level, the basic L ($31,190) and 2.5L ($34,690) seem likely to be relegated to rental lots. 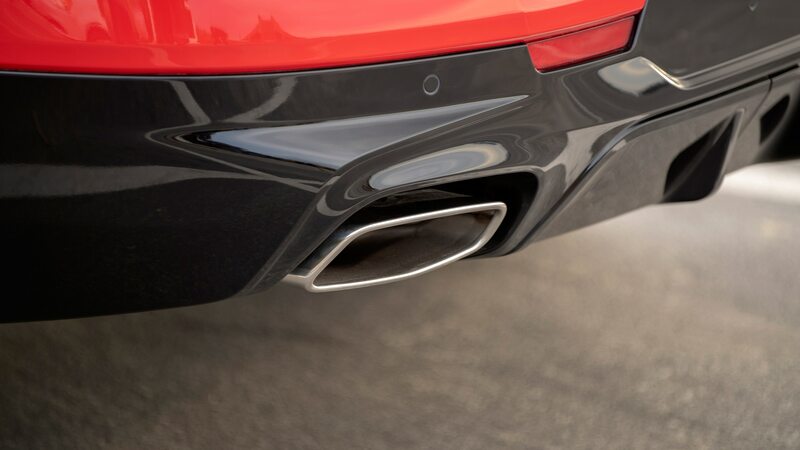 The four is rated for 193 horsepower and 188 lb-ft of torque and is available with front- or all-wheel drive. 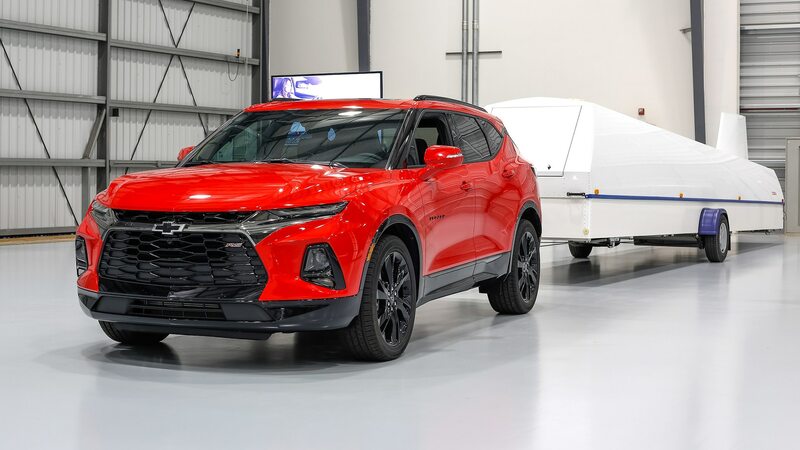 Since our spec chart refers only to the two versions I drove, the RS and the Premier, I’ll add that the mid-level Blazer V-6 with cloth seats starts at $35,690 and the Blazer V-6 Leather at $39,890. 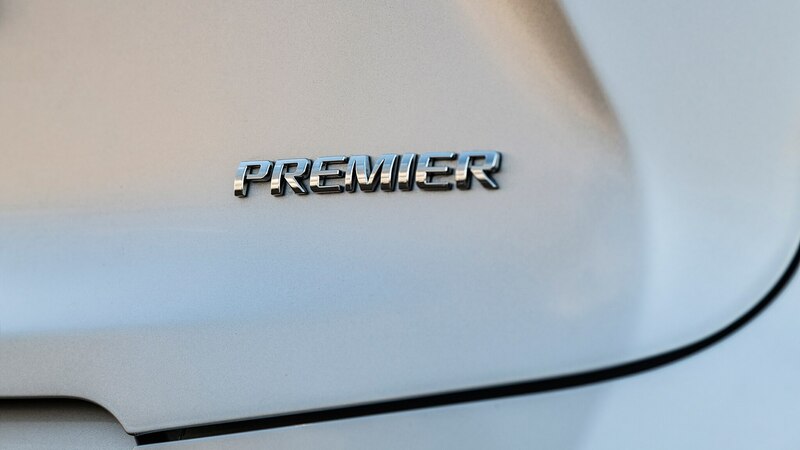 That leaves the Premier and RS to start in the $40Ks and compete, both in price and in content, with the Cadillac XT5. 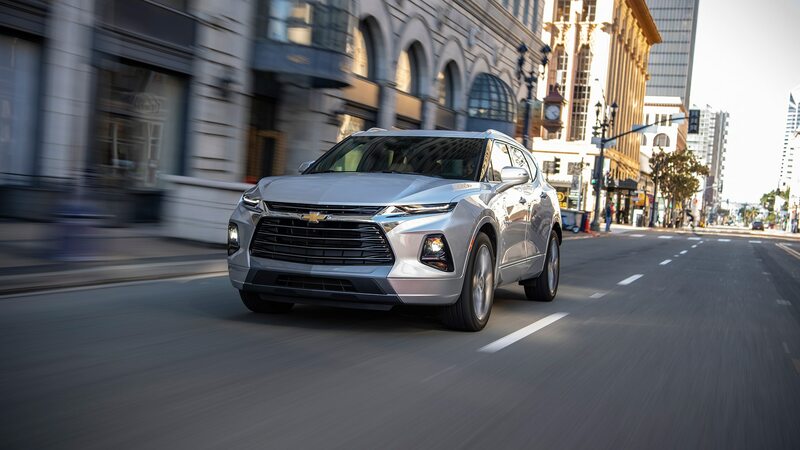 This competition according to Chevy includes the Nissan Murano, the new Honda Passport, the aforementioned Edge, and—although it’s a bit of an outlier—the Jeep Grand Cherokee. 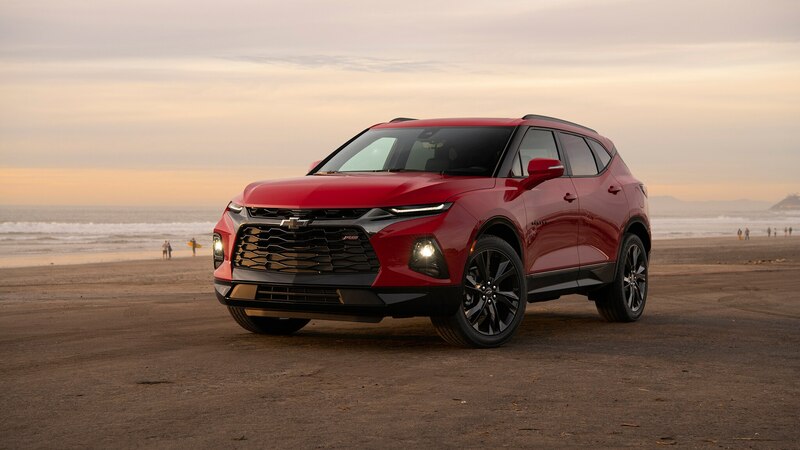 The Chevy Blazer’s 3.6-liter V-6 is more spirited than, say, the version of the engine found in the Traverse partly because of its elevated 11.5:1 compression ratio, says Larry Mihalko, the vehicle’s performance manager. 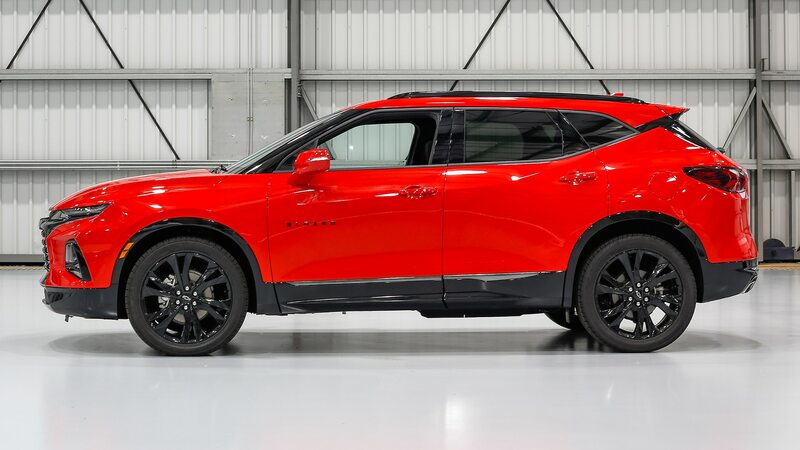 Despite the higher ratio, which it shares with the GMC Acadia, it runs on regular unleaded gasoline. 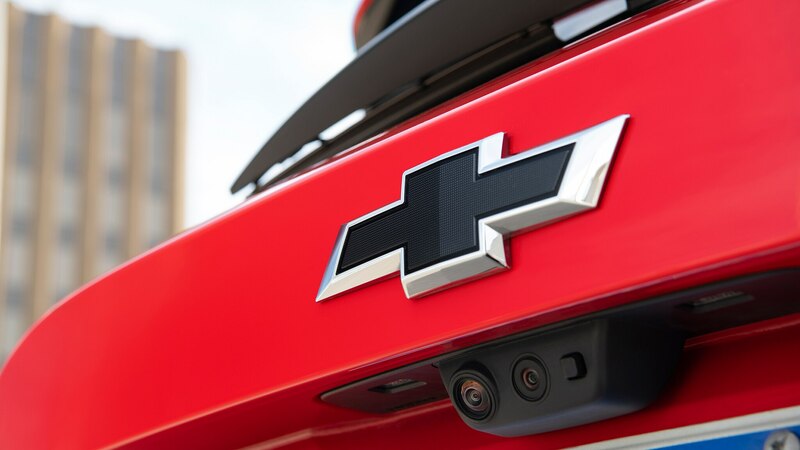 A non-defeatable stop-start system adds about 1 mpg in city driving, Chevrolet estimates. 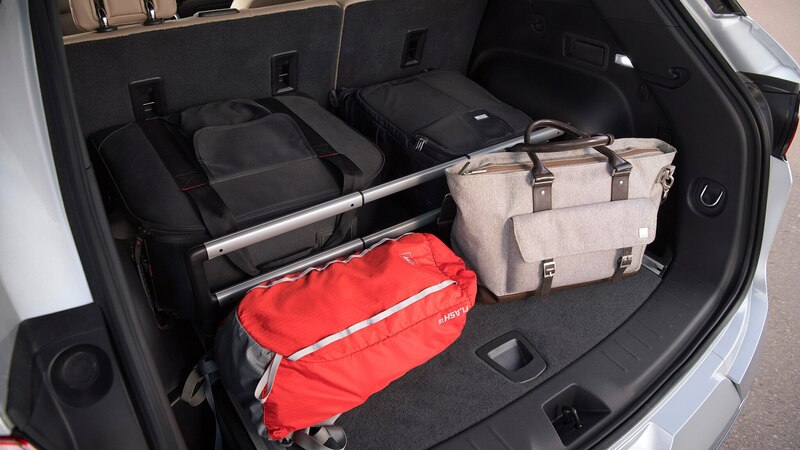 Mihalko is a gregarious, enthusiastic boffin who tends to geek out about engineering solutions he helps discover. 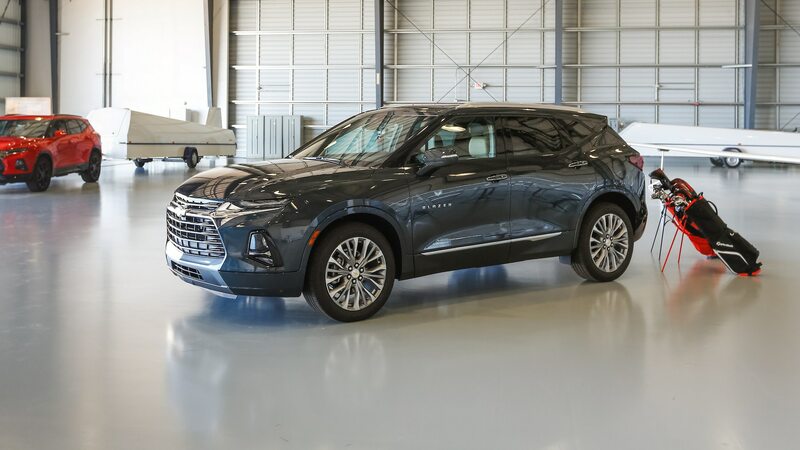 It occurs to me during his outline of the Blazer’s chassis and drivetrain particulars that we have come full-circle since the 1980s, when interlopers like Honda and Toyota proved to GM and its domestic rivals that family sedans don’t have to handle like land yachts. 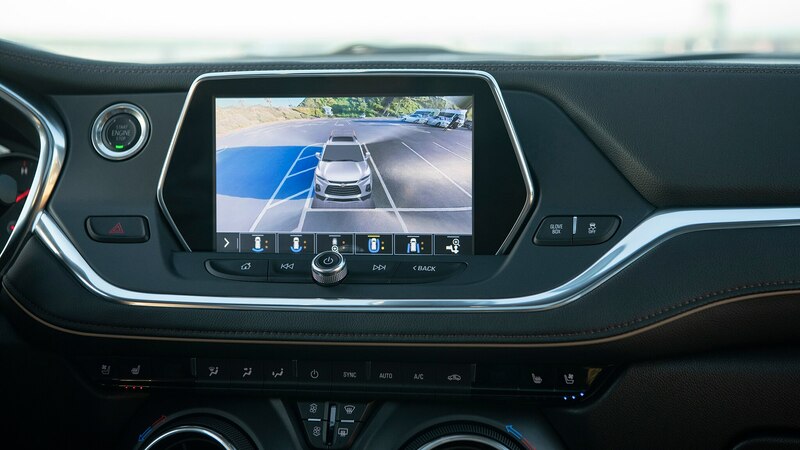 Now automakers both foreign and domestic are trying to figure out how to overcome the laws of physics by making heavy, tall vehicles with 20- or 21-inch wheels handle and ride like cars. 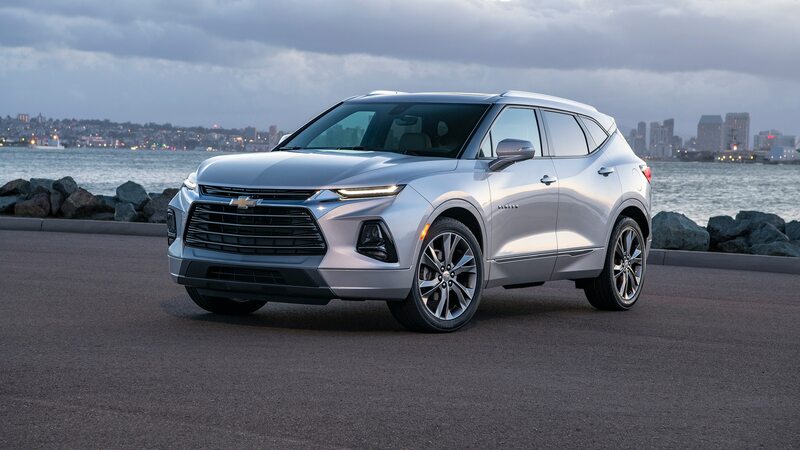 I started in a loaded 2019 Chevrolet Blazer Premier AWD, and while San Diego traffic prevented me from pushing too hard, the suspension is tuned to allow for some body roll and a compliant ride without any wallowing. 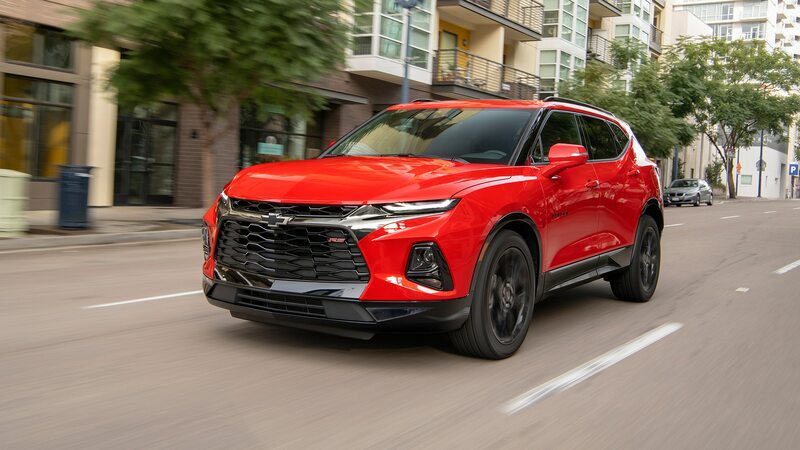 With 270 lb-ft of torque, the front wheels want to steer themselves a bit under throttle at mid-range rpm, though most aren’t likely to induce the behavior very often. 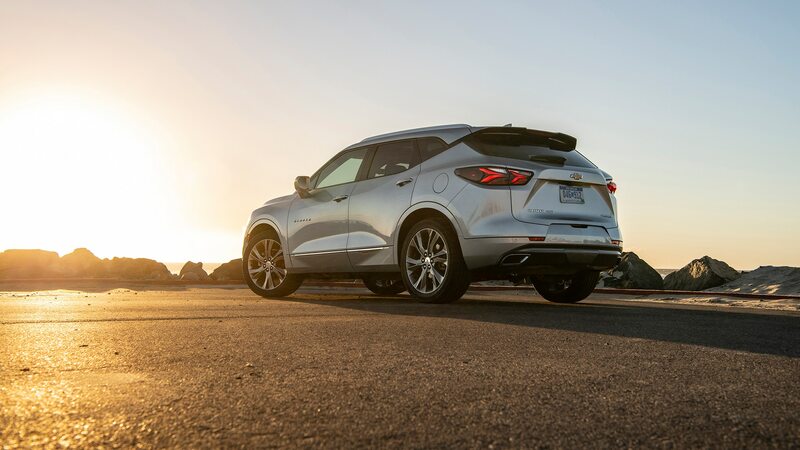 If you’re wondering about torque steer in an all-wheel-drive vehicle, it happened while we were in FWD-only “Normal” mode—the AWD system never engages automatically. 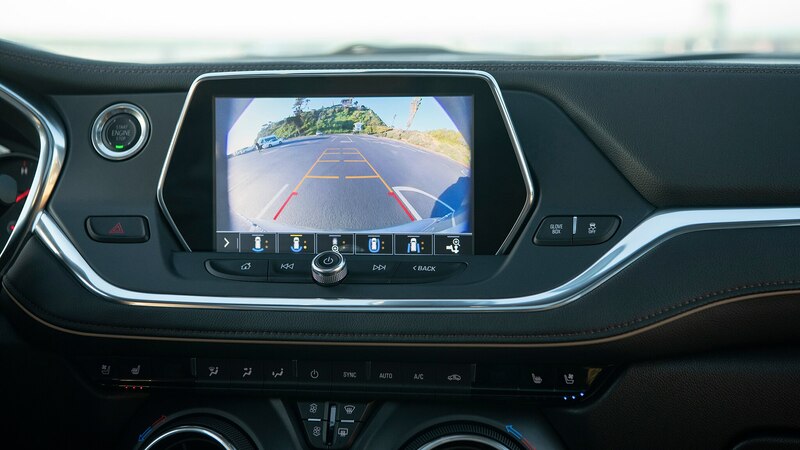 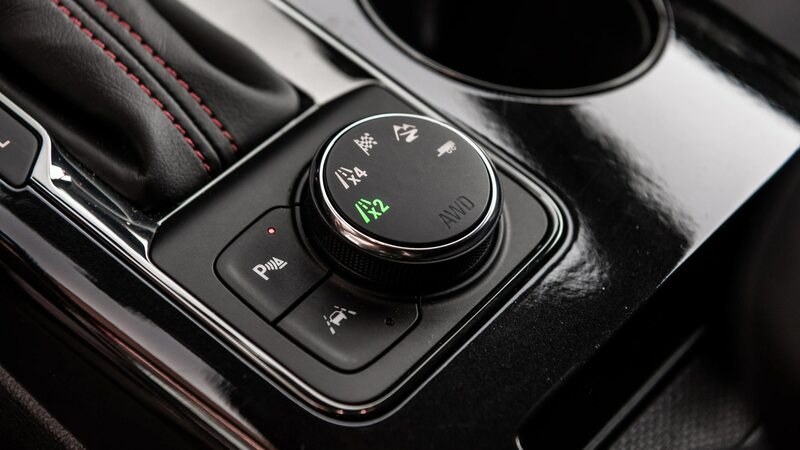 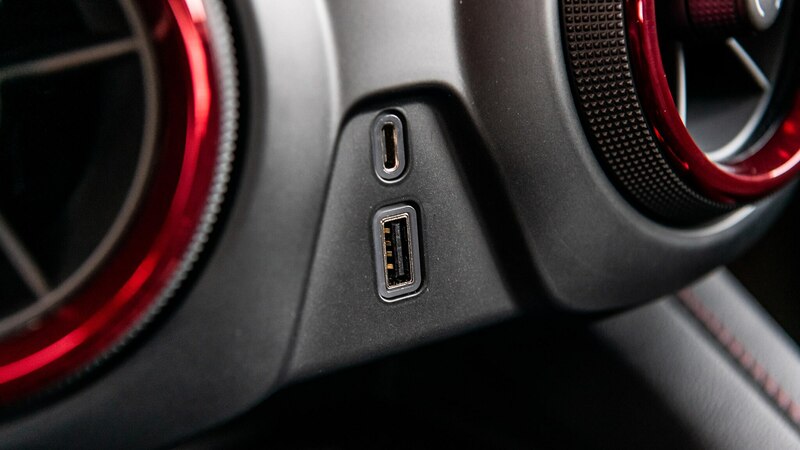 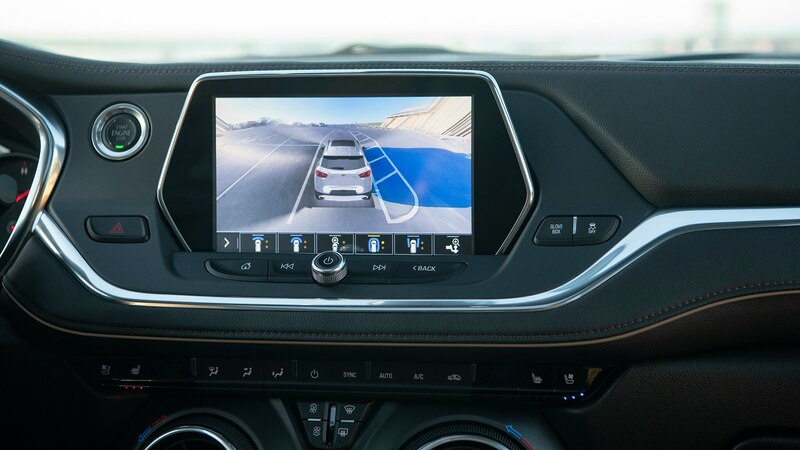 Instead, there’s a center-console dial in all-wheel-drive Blazers that is used to call up 4×4 or Sport modes and their attendant full-time AWD. 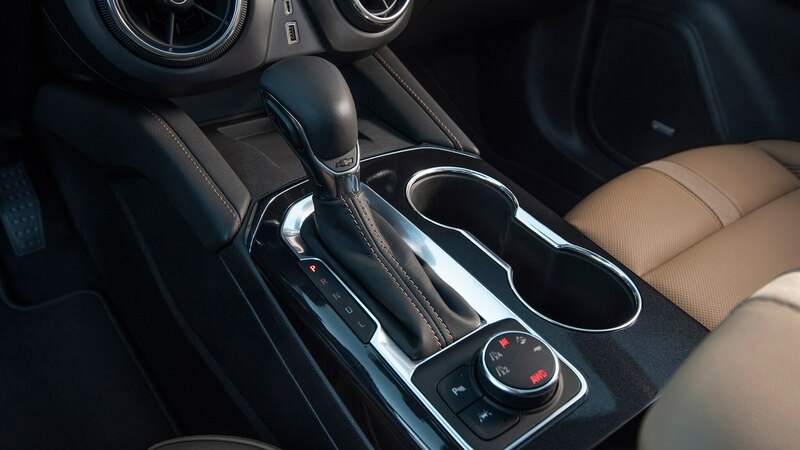 The latter delivers less yaw control via the dual-clutch torque-vectoring rear-differential fitted to RS models (non-RS AWD Blazers have a single-clutch rear differential). 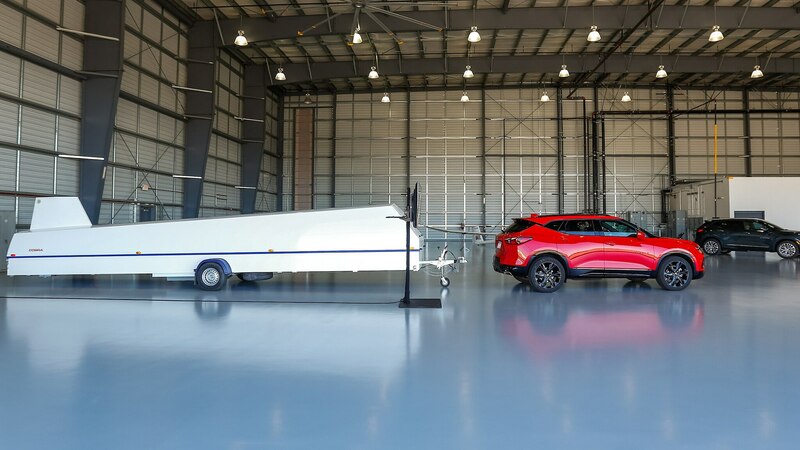 There’s also an optional tow/haul feature that engages AWD. 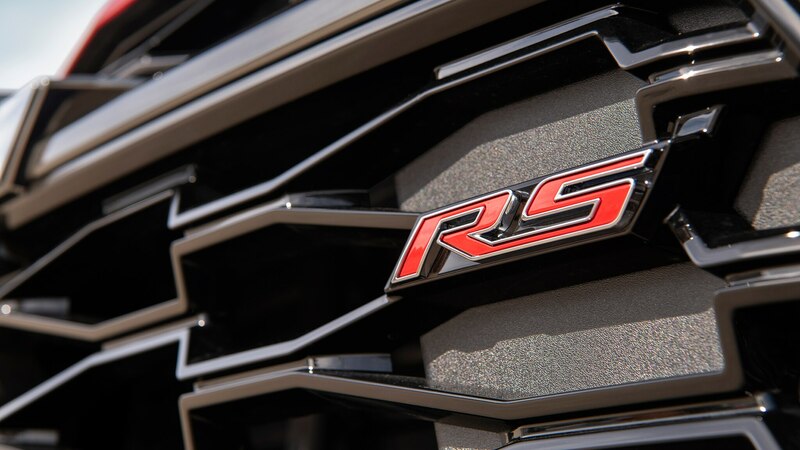 I stuck with the Normal mode, thinking I’d wait to try the AWD system on the RS during the second day of the drive program. 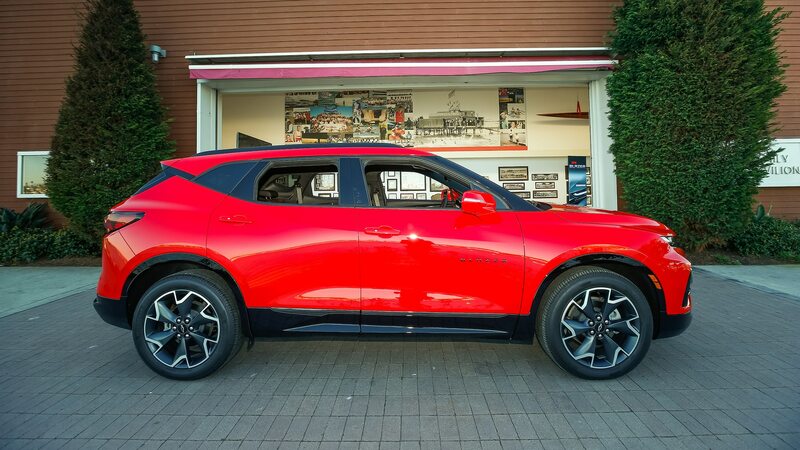 Darn the luck, I ended up with a FWD RS instead. 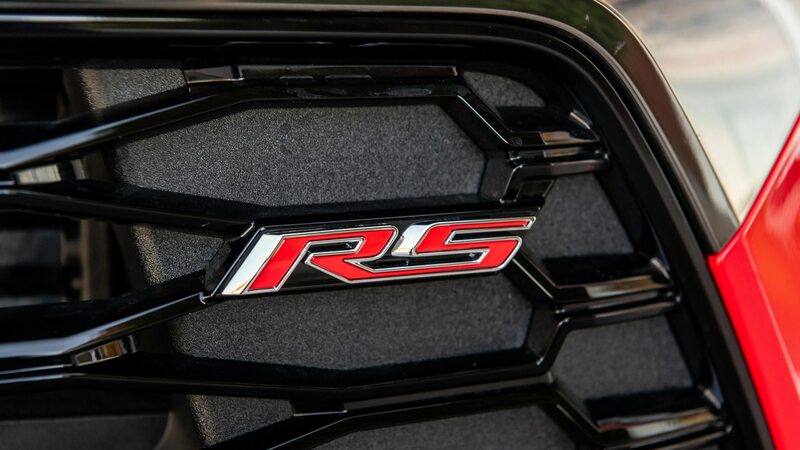 The RS comes with a quicker, 15.1:1 steering ratio versus other Blazers’ 16.1:1 setup. 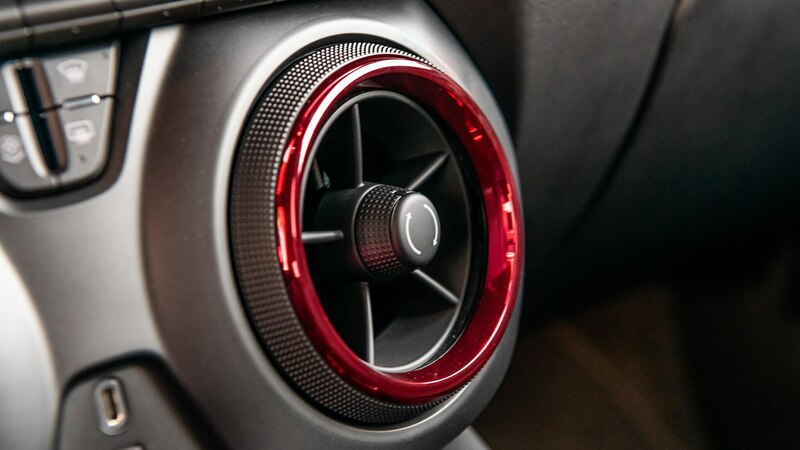 The electrically assisted power steering is a belt-driven rack-mounted system, and while it’s precise with surprisingly good feedback, it never felt particularly quick even in RS-spec. 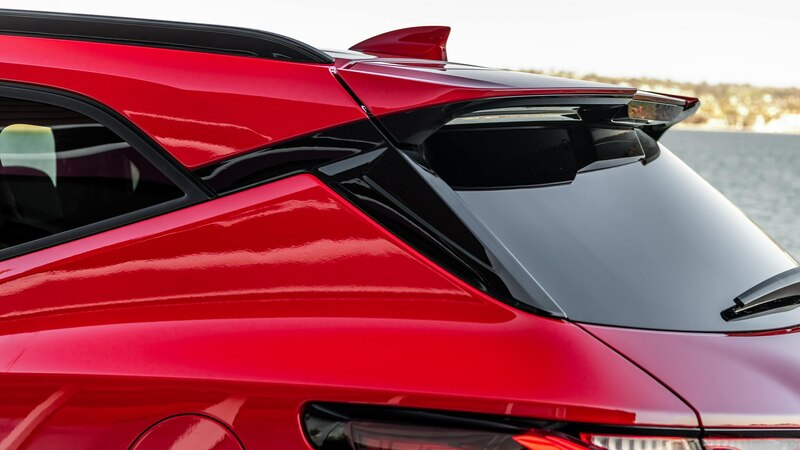 The RS feels more neutral and slightly stiffer while cornering, although its dynamic improvements are incremental and not monumental, mostly because the base suspension is very good. 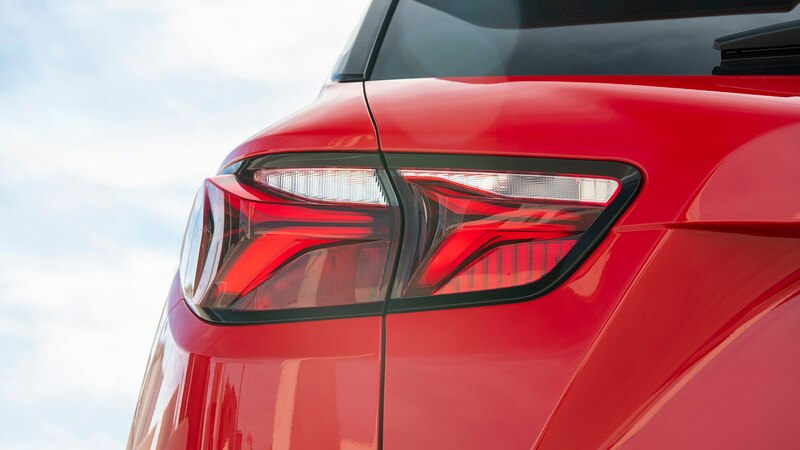 Neither suspension is the least bit harsh—with the caveat that we were on tabletop-smooth roads—and no Blazer is reluctant to turn-in. 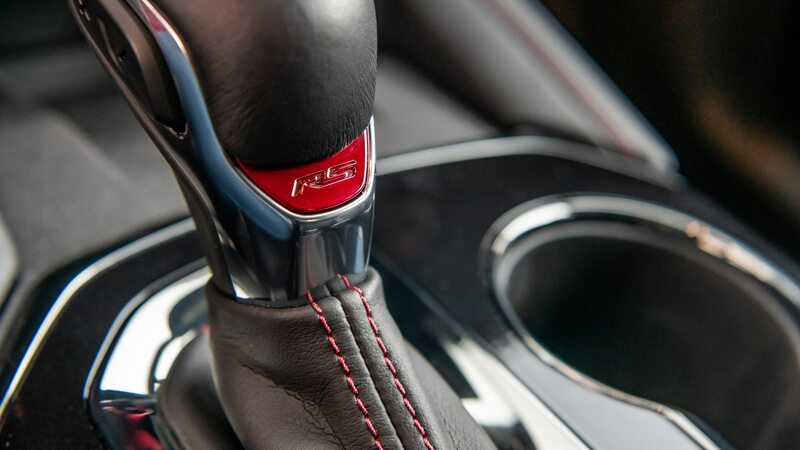 I did particularly like how the RS fervently holds a lower gear all the way through a corner when in Sport mode. 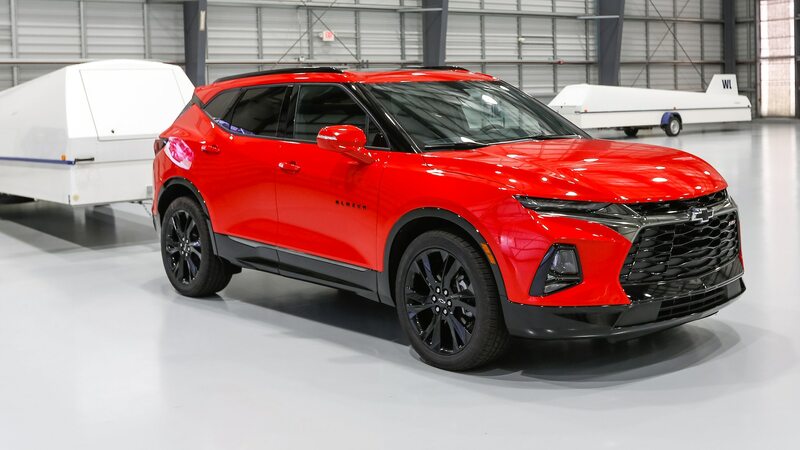 Is Blazer the new Camaro? 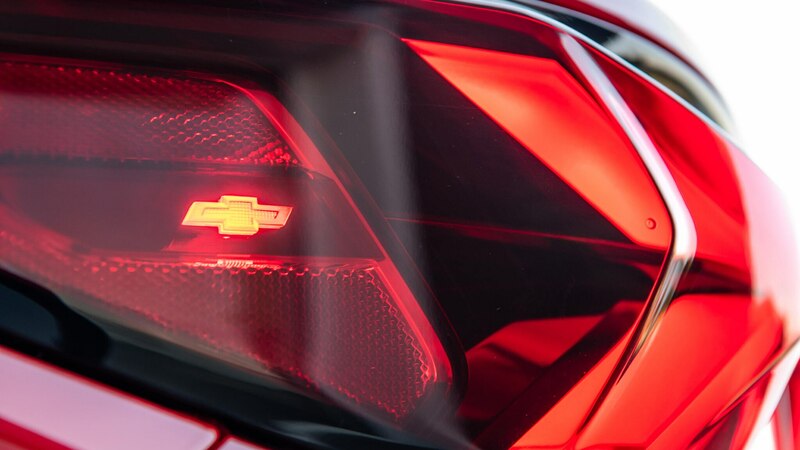 Not for enthusiasts who drive cars like the Camaro the way they’re meant to be driven. 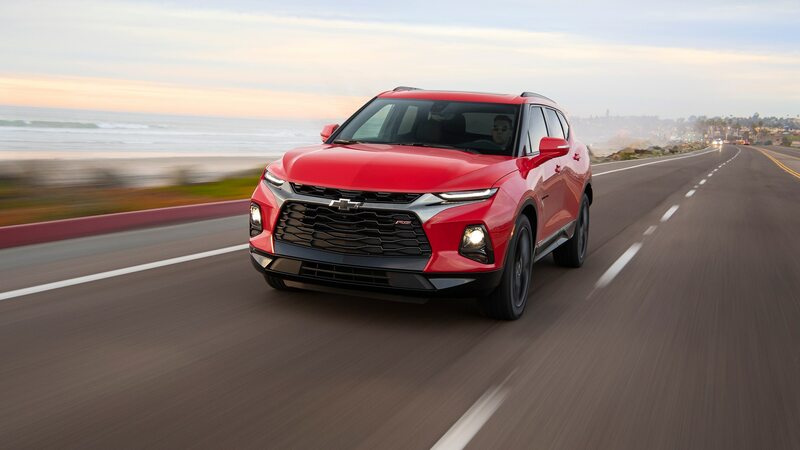 But mainstream consumers who purchase such crossovers to break out of midsize-sedan or compact-SUV monotony will discover enough Camaro in the Blazer’s design—if not its handling—to find some equivalency. 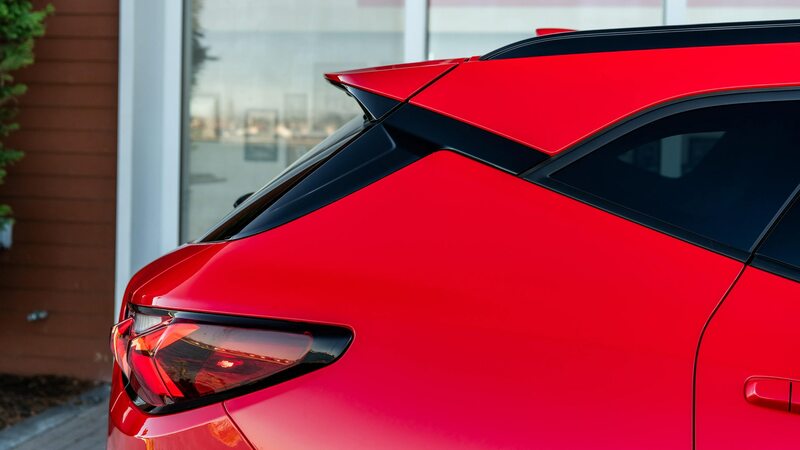 And I’ll admit it is more fun to drive than most utilities. 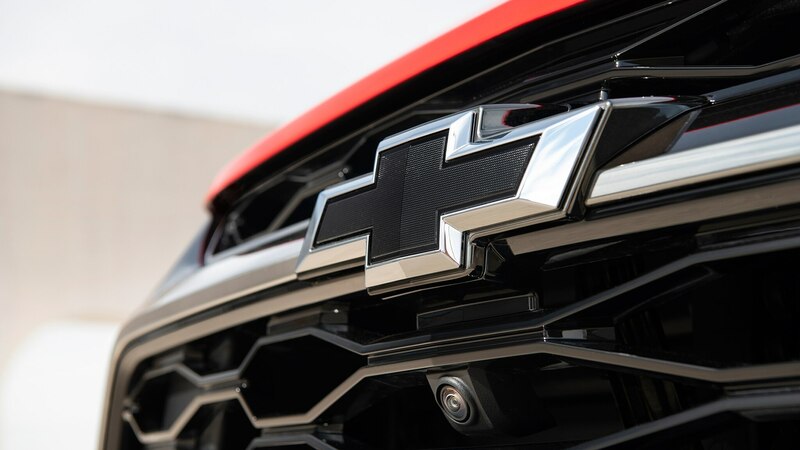 There are a couple of issues surrounding Chevy’s new baby that can’t go unmentioned: Its name first and foremost, because it once belonged to a truck-based Bronco competitor, and that it is being assembled in Mexico, as GM plans to close up to five U.S. factories. 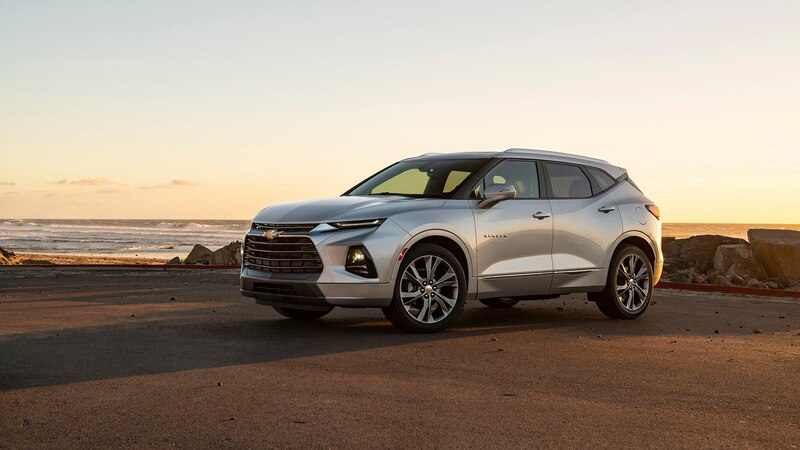 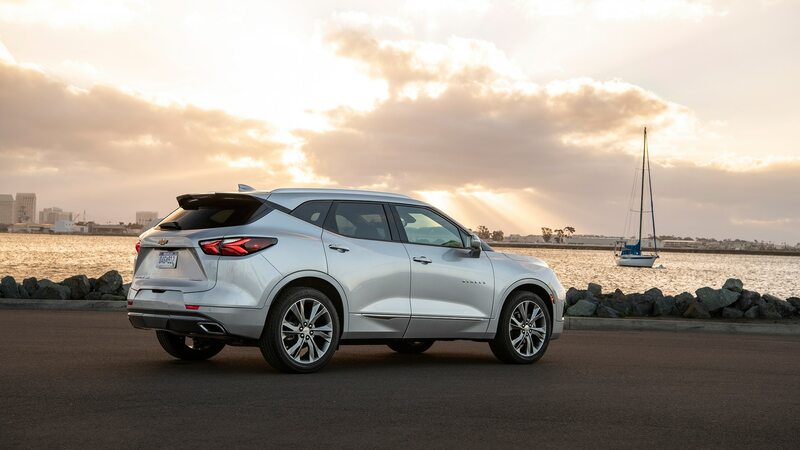 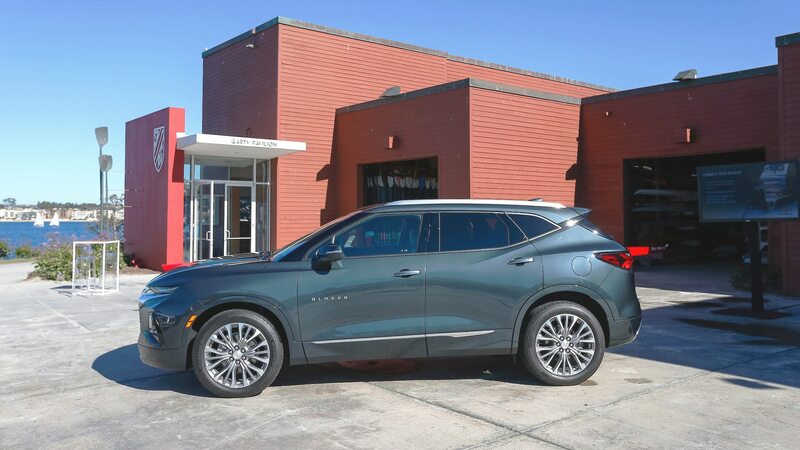 These concerns aren’t likely to affect the 2019 Chevrolet Blazer’s success on the sales charts.